Synthesio is a social intelligence tool used for the purpose of social media monitoring and social analytics. It utilizes the crawling web method for catching relevant data, and the information it acquires is enriched with sentiment analysis and demographics that helps in building up a social analytics dashboard. 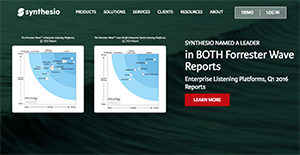 The purpose of Synthesio is to extract the actionable insights available on the Web. Its aim is to be able to satisfy customers with the products they want. It provides a dashboard configurable to the needs of a particular business, and these dashboards are all dependent on the human vetting of the data according to the business requirements. Synthesio is a state-of-the-art tool that purifies data with human assistance and is targeted at organizations in need of clean and useful data. It also provides a customizable dashboard and helps businesses in tracking things based on their needs. Synthesio sets up its software as per your requirements and human monitoring is done at the backhand. Each enterprise has different requirements and needs a software that can be customized for their size, type of employees and customers, and the specific industry they are in. For these reasons, no system can offer perfect functionality off-the-shelf. When you search a software product, first be sure what you want it for. Read some Synthesio reviews and ask yourself do you want basic features or do you want sophisticated functionality? Are there any industry-specific tools that you are seeking? Obtain the answers to these queries to aid your search. There are multiple elements that you need to mull over and these include your finances, specific business needs, your organization size, integration needs etc. Take your time, try out a few free trials, and finally select the app that presents all that you need to enhance your firm effectiveness and productivity. How Much Does Synthesio Cost? Synthesio pricing is available on a by quote basis only. Contact Synthesio directly for more detailed pricing information. We realize that when you make a decision to buy Marketing Software it’s important not only to see how experts evaluate it in their reviews, but also to find out if the real people and companies that buy it are actually satisfied with the product. That’s why we’ve created our behavior-based Customer Satisfaction Algorithm™ that gathers customer reviews, comments and Synthesio reviews across a wide range of social media sites. The data is then presented in an easy to digest form showing how many people had positive and negative experience with Synthesio. With that information at hand you should be equipped to make an informed buying decision that you won’t regret. What are Synthesio pricing details? What integrations are available for Synthesio? Pros: I like that this tool provides us with robust data on business pitches and it provides with thorough knowledge on potential clients and their behavior on social media. ROI provides us with information on how social media works and our performance. This tool has one of the best client service and account managers, they help us get best experience from this product, they help us to figure out how this product works and what we get from it. Cons: There are some websites that we cannot pull out data from but I’m satisfied from this product at the end of the day. Pros: What I like most about Synthesio is its flexibility, you can easily customize the dashboards so it can meet all your needs. I like the multiple topic structure approach for developing queries. The customer service is responsive, always willing to help and they care about our performance. Cons: I’d like to see native platform engagements including mentions in the export. But when I mention this to their customer team they told me that they would work on this one. If you need more information about Synthesio or you simply have a question let us know what you need and we’ll forward your request directly to the vendor.